How Will My Door Look in My House? It is easy to design your own door with our Door Builder. There are hundreds of doors to choose from, but with Door Builder, you can choose your door in just a few steps. AND... you can preview your door in a house style similar to your own to know beforehand how well your door will complement your home. For example, you have chosen an entry door and a sidelite to match. 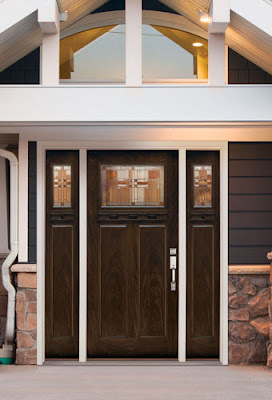 Your house is a Craftsman and you wonder how the door will look in a home style similar to yours. Click on Home View button and select from a variety of architectural styles - Colonial, American, Ranch, etc. Select a house style similar to yours and see how the door looks! In this case, the door complements the house beautifully! Easy, right? Don't hesitate to try Door Builder and find your dream door. Why Get Energy Star Products? We mentioned tax refund for energy rated doors has been extended through 2013. If that isn't enough of an incentive, Home Depot has additional 5 great reasons to bring Energy Star rated products (doors, windows, etc.) home. It's good for your wallet, your home and your environment. 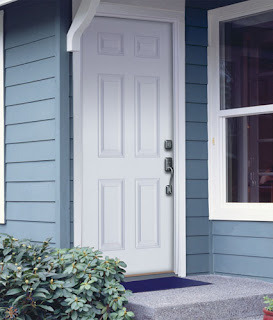 If you're looking for a new entry door, here are our Energy Star Qualified entry doors. Have you ever thought about whether entry doors to your garage, basement or utility room (and elsewhere) are fire rated? 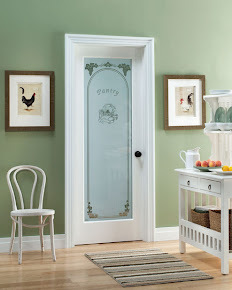 Fire rated fiberglass doors give you 20 minutes of protection to escape in an event of fire. 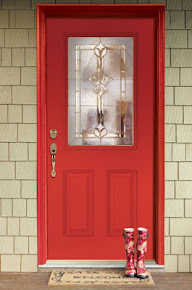 Since they're made of fiberglass, they are more impact resistant than wood doors as well. They're stylish, too. The classic 6 panel design* is available in both white and unfinished oak. Take a moment to check out fire rated doors. *Our fire door embossment is more traditional and different from our premium woodgrain and smooth door styles.